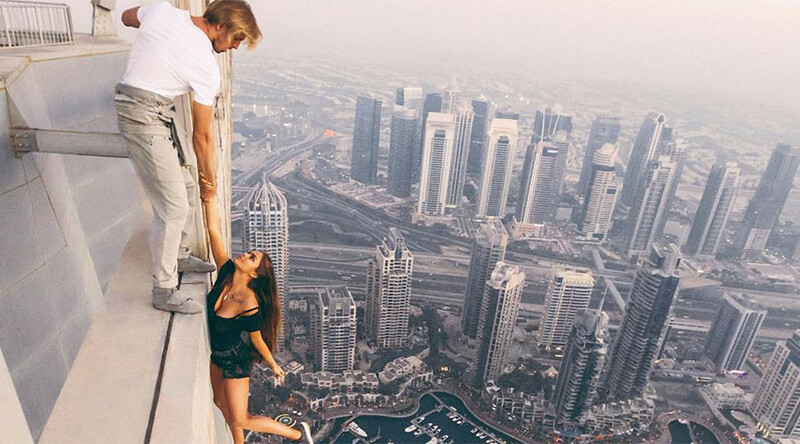 Russian model Viktoria Odintsova has been heavily criticized online for a photo shoot where she hangs off a Dubai skyscraper without any safety precautions. The St. Petersburg-born model, 22, has been publishing the photos and videos from the shoot on her Instagram account, starting six weeks ago. “I still can’t believe I did it. Every time I watch the video my palms go sweaty,” Odintsova wrote in a recent post. Her first Instagram video from the photo shoot garnered over one million views. But while some fans of her racy Instagram account (she has over 3 million followers) were impressed with her bravery, many found it reckless and immature. “A very bad example for the youth,” “This is so dumb, i have no words for it. Seems like some 11 year olds want to get attention at all costs,” “crazy! looks like god gave you beauty, but seems like he forgot to grace you with a brain” are just some of the milder comments. Just recently another Russian daredevil, 23-year-old ‘roofer’ Angela Nikolau, made the news for taking the world’s most dangerous selfies.